What is IDHIFA and what is an IDH2 mutation? IDHIFA is a prescription medicine used to treat people with AML with an IDH2 mutation whose disease has come back or has not improved after previous treatment(s). It is not known if IDHIFA is safe and effective in children. Your doctor has determined that IDHIFA is an appropriate treatment choice for you because you have a specific type of mutation known as IDH2. 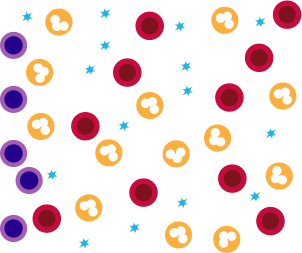 The IDH2 mutation blocks blasts from maturing into healthy adult blood cells. 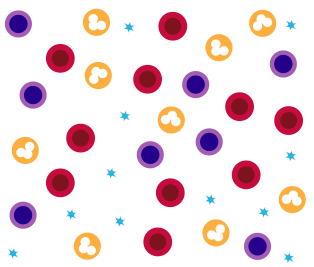 Approximately 8% to 19% of people with AML have this mutation. IDHIFA is not traditional chemotherapy. It is the first and only medication in a class called IDH2 inhibitors that is specifically used for people with relapsed or refractory AML with an IDH2 mutation. The following information may help you understand your treatment with IDHIFA. In normal healthy bone marrow, stem cells mature into normally functioning red blood cells, white blood cells, and platelets—cells that move into your blood and carry oxygen, fight infection, and help stop bleeding. 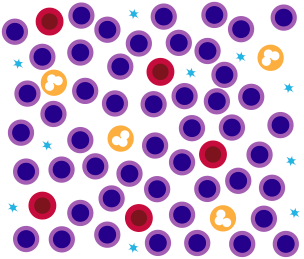 With your type of AML, the IDH2 mutation blocks young blood cells in the bone marrow from growing into healthy adult red blood cells, white blood cells, and platelets. When there are too many young blood cells and not enough healthy cells in the bone marrow, the symptoms of AML begin to occur. IDHIFA works by inhibiting IDH2 and releasing the block on maturation of young blood cells. This means that the young cells in the marrow can grow up to be normally functioning healthy red blood cells, white blood cells, and platelets. This also helps relieve overcrowding of immature blood cells in the marrow. What should I tell my healthcare provider before taking IDHIFA? Click to make a list of your other medications for your doctor.